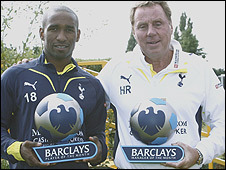 Tottenham's Jermain Defoe and Harry Redknapp have been named the Barclays Player and Manager of the Month. The Spurs duo have been rewarded for the club's stunning opening to the Premier League season, with four wins out of four during August. It is the first time the 26-year-old Defoe, who bagged a hat-trick away to Hull and scored three times for England in as many games, has won the award. Redknapp, 62, claimed his sixth Barclays Manager of the Month honour. Tottenham's impressive start to the campaign has seen them rise to second spot in the Premier League behind Chelsea. Their season began with an impressive 2-1 home win against Liverpool and they then crushed Hull 5-1 before continuing their fine form on their travels by beating West Ham 2-1, with Defoe getting on the scoresheet. The north London club preserved their 100% record in August, with a last-gasp Aaron Lennon winner helping to see off newly-promoted Birmingham City 2-1. Defoe first signed for Spurs in January 2004, making over 100 appearances before moving to Portsmouth four years later. He then returned to White Hart Lane to link up once again with his former boss Redknapp in January this year. Redknapp had nothing but praise for the forward, who has already scored four league goals this season. "He's been in good form, he looks strong and quick and more powerful and stronger than he has in the past," said Redknapp. "All the work he's been doing in the gym is paying dividends. Every time he gets the ball in and around the box he looks like he will score - and that's a nice feeling to have as a manager."